Mind has only one capacity and that is to dream. And this dreaming continues even while you are awake. That’s the reason Sosan or Jesus won’t believe that you are ever awake, because dreaming has one quality: that it can happen only in sleep. These two things have to be understood first: mind is the source of all dreaming, but dream can happen only in sleep. And if you are dreaming twenty-four hours a day, one thing is absolutely certain: that you are fast asleep. Close the eyes any moment and the dream is there; it continues as an undercurrent. Even while you are engaged, for all outward purposes you seem to be awake, but deep down a current of dreaming goes on and on and on. Any moment, close the eyes and it is there. It is not interrupted by your occupations. You walk on the street, you drive the car, you work in a factory, in the office – it continues. You go to sleep, then you can feel it more because, unoccupied, the whole attention comes to the mind. It is just like the stars. In the day you cannot see stars in the sky. They are there, because where can they go? But because of the light of the sun you cannot see them. If you go in a deep well, two hundred feet down, from there you can see stars in the sky even in the day. They are there, but because of so much light you cannot see them. Darkness is needed for them to be revealed. The same happens with dreaming; dreams are there in the day also, but darkness is needed so that you can see them. It is just like when you go to a theater. If the doors are open the film may continue but you cannot see. Close the doors, make the room dark, and you can see. Dreaming is your continuity, and unless this continuity is broken you cannot know what truth is. The question is not whether truth is very far away or near, the question is whether the mind is in a dream or not. So the basic problem is not how to seek the truth; you cannot seek with a dreaming mind, because whatsoever will come before you, your dreams will be imposed on it. Your dreams will be projected on it, you will interpret it. You will not be able to see as it is. You will see according to your dreams, you will falsify it. Truth IS there, because only truth can be – untruth cannot be. So another thing before we enter the sutra: Shankara has divided reality in three categories, and those categories are beautiful to understand. One category is the category of the truth: that which is. In fact nothing else is possible; only truth is and only truth can be. So three categories. Truth, that which is. If your eyes are clear, unclouded, if the mind is not dreaming, then there is only one category – truth. But if your mind is dreaming then two other categories come into existence. If you become aware that “I am dreaming and this is false,” the dream is broken, you are awake already. The dream existed for a few hours; it had one quality of truth, that it existed. But it is not true because in the morning you find it was not. It was just a thought, a wave in the air, a flower in the sky – appeared to be true but was untrue. Truth is being, untruth is non-being, and between the two there is a world of dreaming – it carries the qualities of both. And mind is the source of dreaming, so mind IS illusory. Mind is the source of all maya. You may be thinking that if you leave the world and go to the Himalayas you will attain to truth. You are wrong, because your house is not maya, your wife is not maya, your children – no. Your mind is maya. And how can you leave the mind here and go to the Himalayas? The mind is within you. If you can drop it, you can drop it anywhere. If you cannot drop it, you cannot drop it whether you go to the Himalayas or not. The wife, the children, the house, the world, is called maya, illusion, in a secondary sense – because the wife exists, she has a being. She is a Brahma in her own right, she is truth – not as a wife, but as a soul. Your mind interprets her as wife: “She is my wife.” Then a dream is created. She is there, absolutely true! You are here, absolutely true! And between the two a dream happens. You call her your wife, she calls you her husband. Now a dream exists between the two, and dreams always become nightmares. So all relationships ultimately become nightmares, because you cannot tolerate an illusion very long. An illusion is temporary; sooner or later it has to disappear. It cannot be eternal, it cannot be permanent. You love a woman, a dream is created. But how long can you dream? By the time the honeymoon is finished the dream is gone – even before. Then what will you do? Then you will pretend, because now you are a slave of your own promises. You will pretend that you still love, you will pretend that “You are still beautiful,” you will pretend that “There exists no person like you.” But now everything is a pretension. And when you pretend, and the dream is broken, and you still carry the dream, it becomes a burden and nightmarish. That’s why you live in such suffering. The suffering is nothing but broken dreams, broken rainbows, broken illusions, appearances. And you have invested in them so much you cannot look at the truth: that from the very beginning they were dreams. Rather than looking at the truth you will throw the responsibility on the other. You will say, “This wife has deceived me. She was not as good as she appeared. She deceived me, she didn’t reveal her true reality.” And you will not see that that is not the point at all. You were creating a dream around her, and because of that dream you couldn’t see the reality. She was also creating a dream around you. So whenever two persons fall in love there are not two persons, there are four: one the lover, another, the beloved, and between these two the beloved that is a creation of the mind of the lover, and the lover that is a creation of the mind of the beloved. These two are dreams, and these two go on moving. But mind is never clever. The essence of mind is foolishness, so mind can never be clever. It can be cunning, cunning in its foolishness, but it can never be wise. That is not its nature, because wisdom happens only when dreaming leaves. So if dreaming is the basic reality of the mind then it can never be wise. A Buddha is wise because now there is no mind. 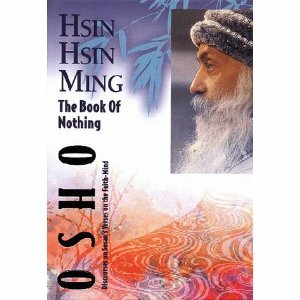 A Sosan is wise because now he lives in no-mind, now all dreams stop. He looks at things as they are. You never look at things as they are; you mix with your illusions. And you are so afraid to look straight because you know, unconsciously, deep down somewhere you know, that things are not as you look at them. But you think if you look at the reality of things it will be too much, too heavy – you may not be able to stand it. You mix it with dreams just to make it a little sweeter. You think it is bitter so you coat it with sugar. You coat a person in dreams and you feel the person has become sweet? No, you are simply deceiving yourself, nobody else. Hence, so much misery. It is out of your dreams that the misery has happened, and one has to be aware of this phenomenon. Don’t throw responsibility on the other; otherwise you will create other dreams. Look that it is you who are projecting, but it is difficult to look. In a theater, in a cinema hall, you look at the screen, you never look at the back – the projector is at the back. The film is not there really on the screen; on the screen it is just a projection of shadow and light. The film exists just at the back, but you never look at that. And the projector is there. Your mind is at the back of the whole thing, and the mind is the projector. But you always look at the other because the other is the screen. When you are in love the person seems beautiful, no comparison. When you hate, the same person seems the ugliest, and you never become aware of how the same person can be the ugliest and the same person can be the most beautiful. When you are in love the same person is a flower, a rose, a rose garden with no thorns. When you dislike, when you hate, flowers disappear, there are only thorns, no more a garden – the ugliest, the dirtiest, you would not like even to see. And you never become aware of what you are doing. How can roses disappear so soon, in a single minute? Not even a gap of a single minute is needed. This moment you are in love and the next moment you are in hate; the same person, the same screen, and the whole story changes. Just watch and you will be able to see that this person is not the point, you are projecting something. When you project love the person looks lovely, when you project hate the person looks ugly. The person is not; you have not seen the real person at all. You cannot see the reality through the eyes of the mind. If you really want to know what the truth is, scriptures won’t help. Neither will going to the Himalayas be of any help. Only one thing can help: start looking at things without the mind. Look at the flower and don’t allow the mind to say anything. Just look at it. It is difficult because of an old habit of interpreting. You go on interpreting and interpretations differ. Interpretations depend on the mind. It depends on the mind how you interpret things. How you look at things depends on you, not on things. Unless you come to a point where you drop the interpreting mind and look direct, look immediate, mind is your mediator. It brings you things distorted, it brings you things mixed with interpretations. They are not pure. So the only way to reach to truth is: how to learn to be immediate in your vision, how to drop the help of the mind… This agency of the mind is the problem, because mind can create only dreams. But beautiful dreams mind can create, and you can get so excited. Through your excitement the dream starts looking like reality. If you are too excited then you are intoxicated, then you are not in your senses. Then whatsoever you see is just your projection. And there are as many worlds as there are minds, because every mind lives in its own world. You can laugh at others’ foolishness, but unless you start laughing at your own you will not be able to become a man of Tao, the man of nature, the man of truth. So what to do? In the beginning it will be difficult, but start with things in which you are not too much involved. It will be difficult to look at your wife without bringing words in. You are too much involved, too much emotionally attached. Angry or in love, but too much involved. Look at things which are neutral – a rock, a flower, a tree, the sun rising, a bird in flight, a cloud moving in the sky. Just look at things with which you are not much involved, with which you can remain detached, with which you can remain indifferent. Start from neutral things and only then move towards emotionally loaded situations. People start from the loaded situations; they fail, because it is almost impossible. Either you love your wife or you hate, there is no in between. If you love you are mad, if you hate you are mad – and both ways the words will come. It is almost impossible not to allow the words, difficult, because of so much practice in saying something continuously. Even in sleep, or awake, when you are emotionally too much involved, it is difficult to put the mind aside. It will come in. So look at unloaded situations first. When you have the feeling that, yes, you can look at certain things without the mind coming in, then try with loaded relationships. By and by one becomes efficient. It is just like swimming: in the beginning you feel afraid and in the beginning you cannot believe how you will survive. And you have been working with the mind so long you cannot think that without the mind you can exist for a single moment. But try! And the more you put the mind aside, the more light will happen to you, because when there are no dreams, doors are open, windows are open, and the sky reaches to you, and the sun rises and it comes to the very heart, the light reaches you. You become more and more filled with truth as you are less and less filled with dreaming. And if while you are awake dreaming stops, by and by when you are asleep dreaming will stop there also, because it can exist only as a continuous circle. If it is broken anywhere, by and by the whole house disappears. You take out one brick and the whole house is already on the way towards being a ruin. Jesus goes on saying to his disciples, “Be awake!” Were they sleeping before him always, continuously? Because he is every day saying, “Be awake!” Buddha teaching his disciples every day, “Be awake!” Why? They were with open eyes, as alert as you are, but Buddha and Jesus go on saying, “Be awake!” They mean, “Don’t dream, just be here! Don’t go anywhere else!” In the memories, in the past, and you dream; in the future, in imagination, and you dream. Be here-now – only then is there no dream. In the present there is no dream. In the present there is no mind. In the present you are there and the truth is there. And then there is no gap between you and truth – because both are true and there is no boundary. You melt into truth and truth melts into you. You become Brahma, Brahma becomes you. Dreaming is creating a fence around you, very invisible but subtle, powerful.